In this paper, we report that we have solved the SVP Challenge over a 128-dimensional lattice in Ideal Lattice Challenge from TU Darmstadt, which is currently the highest dimension in the challenge that has ever been solved. 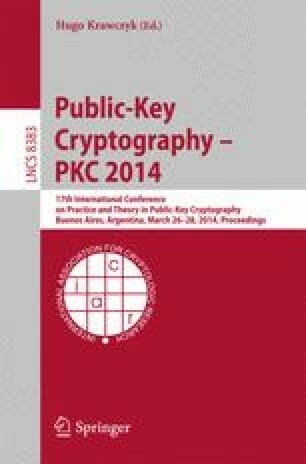 The security of lattice-based cryptography is based on the hardness of solving the shortest vector problem (SVP) in lattices. In 2010, Micciancio and Voulgaris proposed a Gauss Sieve algorithm for heuristically solving the SVP using a list L of Gauss-reduced vectors. Milde and Schneider proposed a parallel implementation method for the Gauss Sieve algorithm. However, the efficiency of the more than 10 threads in their implementation decreased due to the large number of non-Gauss-reduced vectors appearing in the distributed list of each thread. In this paper, we propose a more practical parallelized Gauss Sieve algorithm. Our algorithm deploys an additional Gauss-reduced list V of sample vectors assigned to each thread, and all vectors in list L remain Gauss-reduced by mutually reducing them using all sample vectors in V. Therefore, our algorithm allows the Gauss Sieve algorithm to run for large dimensions with a small communication overhead. Finally, we succeeded in solving the SVP Challenge over a 128-dimensional ideal lattice generated by the cyclotomic polynomial x128 + 1 using about 30,000 CPU hours. The full-version of this paper is appeared in .